Recently, dofetilide, a pure class III agent devoid of beta-blocker activity, has been shown to have a mortality-neutral effect in patients with low ejection fractions. A recent placebo-controlled trial of over 1500 patients with severe left ventricular dysfunction and CHF demonstrated that dofetilide was effective in converting patients to sinus rhythm, maintaining sinus rhythm, and reducing the risk of hospitalizations for CHF with no increase in mortality (87-88). There is, however, a significant risk of torsades de pointes with dofetilide. Dofetilide is eliminated through the kidneys, and dosage adjustments must be made in patients with even minor renal insufficiency. 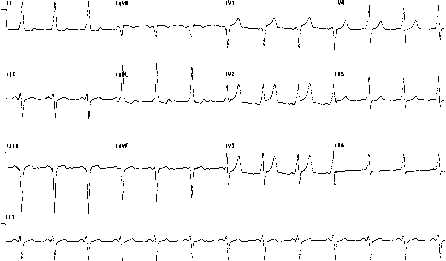 Patients must be hospitalized with continuous cardiac telemetry to monitor for proarrhythmia when initiating or making upward dose adjustments with this medication (88a). Intravenous dofetilide, currently in clinical investigations, can be used to acutely terminate both AF and atrial flutter (89). This drug must also be used with caution (or not at all) in patients who are concurrently receiving QT-prolonging medications.